The best of both worlds. Harmar Hybrid Lifts provide easy drive-on, drive-off convenience for Wheelchairs and/or Power Scooters. The compact design of this AL600 Hybrid Platform Lift fits virtually all scooters & wheelchairs and is ideal for SUV's and smaller crossovers. Smaller vehicle space? New EZ-Detach Seatback accessory converts wheelchairs to a lower profile to fit more easily into small cargo areas. Includes easy-turn handles, weight-distributing handle bar for easy removal and replacement. 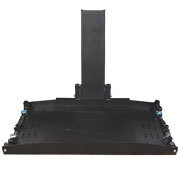 Most compact unit on the market-- requires just 43" of depth!